The Idaho Falls Chukars allowed 4 runs in the 9th inning but held on to win 8-7 at Melaleuca Field on Wednesday night vs the Ogden Raptors in the next to last game in the regular season. The Chukars were eliminated from playoff contention as the Grand Junction Rockies beat the Orem Owlz 3-1 to clinch a postseason bid. The big inning for the Chukars was the bottom of the 5th as they scored 5 runs to make it a 6-0 lead. The Chukars scored on RBI doubles by Jesus Atencio, Julio Gonzalez and Rubendy Jaquez in the inning. Andres Martin added an RBI single in the inning. The Chukars doubled 4 times in the game. Ogden made a late rally in the 9th as they scored 4 times in the 9th to make it a 8-7 Idaho Falls lead. Chukars pitcher Daniel James got the final out on a Marcus Chiu strikeout to secure the victory. It is James 3rd save of the season. Kyle Kasser has 7 multi hit games in his last 11 contests and is hitting .355 on the year. He went 2 for 4 with a run scored and a walk in the game. Jaquez and Reed Rohlman each had 2 hits in the game. The Chukars had 11 base hits in the win to go to 42-33 overall on the year and 21-16 in the 2nd half of play. Despite the win, it's bittersweet because Idaho Falls was eliminated from playoff contention on the next to last day of the regular season. The final game of the season is tomorrow at 7:15 pm at Melaleuca Field. It's Fan Appreciation Day at the ballpark. The Chukars are 21-16 at home this season. Chukars notes: Idaho Falls is 8-7 vs Ogden this season, including a 5-2 record at Melaleuca Field. The Chukars were 7 for 11 with runners in scoring position. Zach Haake made his 2nd start for the Chukars. Haake allowed 1 hit and struck out 3 in 3 shutout innings. Connor Mayes was solid again, scoring 3 runs in 5 inning. Mayes didn't walk any batters and struck out 3. Rubendy Jaquez went 2 for 5 with 2 runs scored, 2 stolen bases and a double. Jaquez is now hitting .444 for the Chukars, going 12 for 27 with 5 RBI's and 2 doubles. Idaho Falls is now 27-20 vs Southern division opponents. 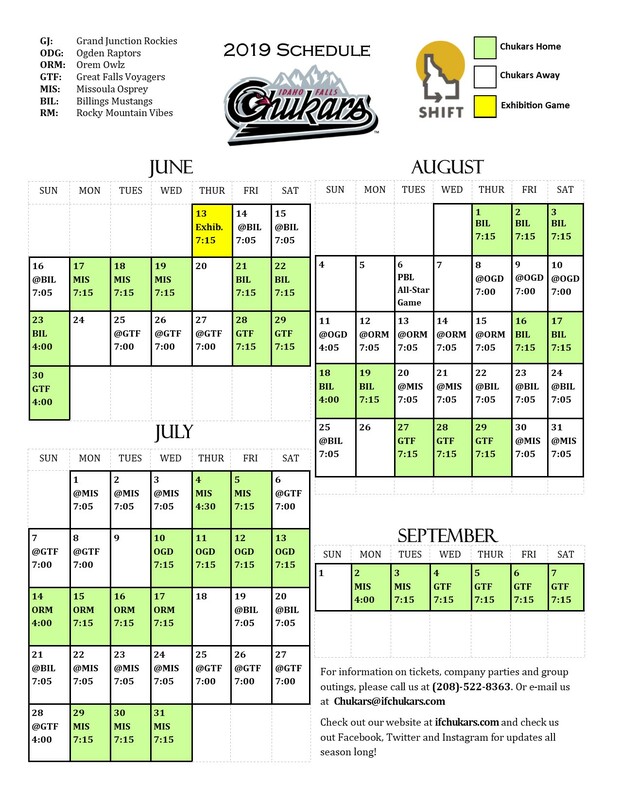 Thursday night will be the last time the Chukars play as a member of the Southern division. They move to the north next year, joining Billings, Missoula and Great Falls. Time of game: 3:01. Attendance was 1,766.